The new colour is trooped so the rank and file can see it. At last! Something has been painted! I won't bore everyone with whines about all the non-wargaming stuff that has been distracting me this fall. Lets just say was -10 Celsius outside last night and felt like my gaming/painting room wasn't much warmer. Winter is coming on apace but at last there is a glimmer of light and heat ahead! Anyway, late last summer the War of Rosish Succession heated up. One of the outcomes of the Battle of Wentworth Pass was a decision to promote the Pandours from Militia/Light Infantry to Line Infantry by adding 8 privates and a Regimental Colour. That has now been done. In keeping with Rosish tradition, the flag consists of a coloured cross on a white background. (Yes I know Russian and Prussian types will be scratching their heads saying haven't you confused the field and the cross but no this is a black St. Windmill's cross on a white background.). I just need to cast and paint 12 more Grenadiers and a company of light infantry and the Rosish infantry will be up to scratch. There is, however, some questioning of the decision to form a light company for the Irish regiment and wide spread support for a Light Company for the Pandours instead in recognition of their past service and their origins in the highlands of the frontier. This would not necessarily mean a change in overall numbers but would mean a departure from a standard 4 company organization if there wasn't. There is even support for more National regiments in traditional garb, possibly as a reaction to the heavy foreign influence under the late King. The 1st National Regiment (aka King Michael Pandours) form as a line battalion for the first time..
During the 1980's I started working on a set of wargame rules which appeared in Wargames Illustrated Issue 23 July 1989. (The one with the Foundry Guillotine on the cover.) In the introduction I argued that despite the difficulties, there was merit in having a common basis for wargame rules in terms of time and distance scales and mechanisms regardless of which campaigns were being covered. Some might think this would blur the differences but I think it actually highlights them. For example if you play one set where infantry moved 6" and bows fired 24" and then play another with different time and ground scales so that infantry also move 6" but cannon fire 24", then to a casual player who has not contemplated the theory behind the rules, cannon and bows are pretty much the same thing. The same is true if Chippewa and Waterloo use the same number of figures, the difference becomes less apparent. There was more to the rules than that and I found it interesting when rereading the article to note that many of my stated design aims still stand. Its also interesting to consider that while I have met several people who tried MacDuff as published in the Courier in 1997 (some more than once!) I have yet to meet or hear from anyone who tried these rules (apart from my long suffering wargame opponent who had to move to Saskatchewan to escape the constant changes). I don't think I ever did all the versions but we did play a 15thC and a WWII version. I was probably influenced by Don Featherstone who seems to have done something similar as did Joe Morschauser although at the time I hadn't heard of him yet. Its bit heretical in some circles these days but I think the main differences over the years of history are in the development of weapons and organization. Minor unit tactics make some difference but I think they are over shadowed by the bigger issues of human psychology, and a shared physical world. To put it an other way, drawing cards or rolling for activation dice, play sequences and so on are just game mechanisms. Changing the mechanism may change the feel but it doesn't necessarily reflect the history behind it. Yes all right, the point is, I'm thinking about doing the same thing again. As it is I keep updating Gathering of Hosts and Hearts of Tin and various other experiments to "share best practices". It would save both effort and confusion to write a core set and then bolt on the applicable extra rules, troop and weapon types etc.. This is especially true if I am going to play various small games in many periods this winter. Using the same core mechanisms such as adding or subtracting numbers of dice as modifiers vs adding to or subtracting from the score of the dice just makes life easier when switching back. I'm happy with the current Pips command rules since requiring an attached leader for group moves makes it easy to tweak the flexibility of various armies by varying both Generals and intermediate commanders. I'm also happy with the abstract hit/morale and shooting rules. I'm waffling slightly on sequence of play and contact vs proximity melee. The actual melee roles etc are fine but while the recent test with no melee phase and adjacent area melee worked ok, it felt slightly wrong even with rifle era troops. 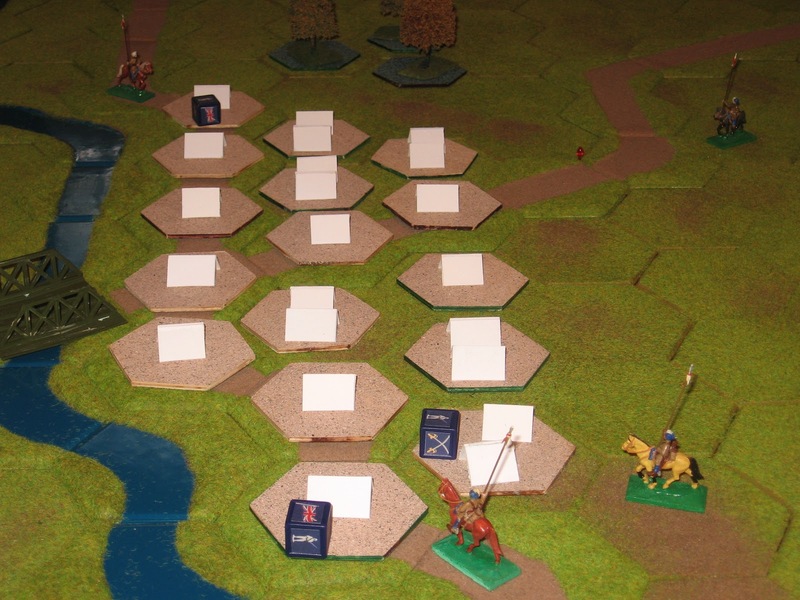 I used Morschauser's 3" melee zone for years on a non-gridded tables, but it never felt right for cavalry and spear troops. I think I'll be happier with contact melee even with a grid. The only real issue would be for someone whose bases filled a grid completely but I'll let them worry abut that..
That leads to the question of movement and zones of control. The distances are fine and the wide historical time span is not an issue. The problem is that this is the bit where grid/no grid makes a difference. The questions are basically how easy is it for a close order unit to turn and reform as opposed to wheeling and how much of a threat is a unit which is neither ahead nor beside a unit. Strictly speaking this is not just a grid issue, its the difference between 1 stand units and multi stand or mass of individuals units. Its also where 90% of the fiddliness of off-grid games comes in. Once I settle that, the core rules are pretty much in existence as are some of the period specifics as its mostly a question of re arranging the existing Hearts of Tin rules and drawing from the Gathering of Hosts and Square Brigadier. No new ideas are being introduced. Not yet anyway! Its not finished yet, for one thing when I dab paint on it the darned stuff seems to take days to dry enough that a dry brush doesn't blend. I figured, may as well find out if the concept works before I put more time in. I'm not quite sure exactly how the 25mm Medieval Scots managed to hijack the play test, there wasn't even a full moon (aka Macfarlane's Lantern in some quarters) but there we are. The Important Bridge scenario from Wargames for All Ages, aka The Red Book. Having two blogs may be one too many but here I am. The Gathering of Hosts was intended to be purely for Ancients, especially my Persians but to share the load all future Ancient and Medieval posts will go there. Not sure yet whether there is enough musket in pike and shot for it to stay here or if the armour and pointy sticks will land it there. Anyway there is a 2 line battle report there (the Scots lost) but I thought I would put some pictures of the board here. The existing bases aren't perfect but close enough for now. The crooked unit had just routed ending the game and was plopped back down again any old how for the shot. Over all I am happy with how the board is coming and didn't have much issue with the few vague areas. I'm still pondering whether rivers should run in between 2 squares like I did in this game or through one. The former makes it clear which side of a river that a unit is on but doesn't really leave room for a unit on either bank and hides some of the shorter grid delineations. The wide dark areas are waiting for some highlights or foliage to break them up a bit. I may add "water" to some of the unflocked areas. See here for some of my local inspiration for comparison these squares will normally be considered to be about 100 yds across or perhaps between 50 and 150 yds depending on the game. A is an area where 2 different colours of green flock look differnet in a good light but fade into sameness in poor light. I have already forgotten what I thought the issue was with C! Oh well. Oh and the stream is blue felt, the bright blue that shows, with streaks of darker blue to break it up. The edges were painted in an earth tone and flocked with coarse foliage since I don't expect to have to put a house or hill on it. Here the dark green lines which represent tall weeds, bushes etc, need to be broken up a bit. There are also a couple of squares of brown that don't appear to be delineated at all. 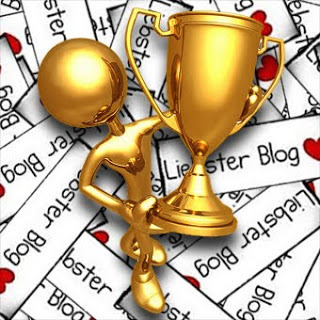 My first reaction to these sorts of things tends to be "I don't do chain letters" but its well meant and while I do on occasion take time to browse other blog's lists of favorites this is a good way to share some that I enjoy and I've just been checking other people's nominees. The rules appear to be to something like post the picture, say thanks and list 5 blogs I really like that have less than 200 followers and let the nominated ones know via a comment. Presumably those with more folowers, such as Bob Cordery's, are already well known. It also seems counter productive to point back to those who nominated me thereby forming a closed loop.. I have also favoured those who blog relatively regularly and those whose interests align most closely with my own, mostly, well sometimes in obscure ways. Corporal Trim's Castles of Tin blog. One of few where I go especially for the pictures and one of very few where looking at them gives me an urge to fix my painting setup, rearrange my schedule and make more time for painting. Littlejohn's Lead Gardens http://littlejohnslead.blogspot.ca/ A willingness to try new stuff, improvise and experiment, a lot of ingenuity, some great looking terrain figures and battle reports. 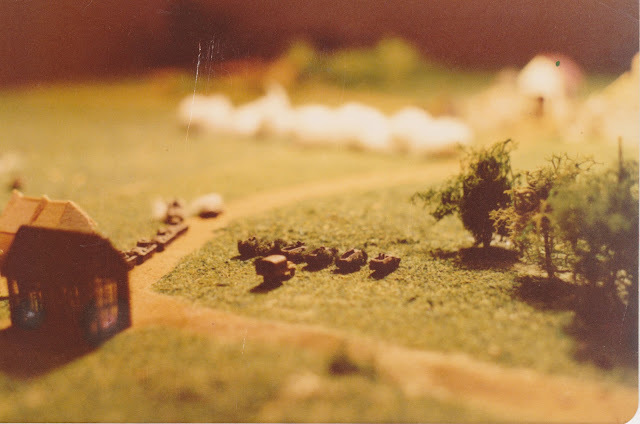 Matt's Airfix ACW Project (and its sister blog In the Grand Manner). One of the reasons I gave in to the urge to resurrect my own. Mosstrooper's Tin Soldiering On. Real toy solidiers. 'Nuff said. MS Foy's Prometheus in Aspic. OK so a 25mm Napoleonic Peninsular campaign is not as obviously a common interest but trust me on this. Somewhere near the Nile a thin red line braces itself for the Mahdist onslaught. All figures and terrain by Ron. This week's game was Reinforcements On Table from Scenarios for Wargamers. This week we played along instead of across the grain. It wasn't until I looked for a "tactical hex" (ie one on the divider line which can be either at will) to place one of my guns on that I remembered that when playing this way, there are no tactical hexes. The evil demon that has been dogging me this month whispered in my ear and I placed the gun in a good position near the road without any thought to sectors. Ooops. It can be hard to predict what cards will be drawn but it usually pays to assign more than 1 unit per sector if possible so that they can support each other and so that a run of cards can be used as well as possible. I had a run all right, a run of right sector cards having between 2 and 4 in my hand all game but only 1 unit to use them! Each time I did use one, I got another one back! Take back the gun men! Initially the British inflicted some hits driving back several units which later rallied. Then a Mahdist assault took the left hand gun. A counter attack retook it but then was over whelmed. At this point three things were going wrong for my Brits, they were missing easy targets, the Mahdists were hitting with almost every die and my hand was loaded with cards that didn't allow me to bring up reinforcements or use any of my troops in the center where I was being attacked! If I had deployed the gun 1 hex to the right it and the right hand infantry unit could have supported each other and at least have done some damage. As usually happens with the Battlecry family, things turned around and the Mahdists had a few quiet turns while I finally manged to get my boys moving. Then the Mahdist cavalry swept around my flank leading to a long ultimately indecisive melee. The Rifle Brigade finally arrived and put paid to the Camelry, apart from their leader who will reappear. Unfortunately their ammo ran out and they decamped, just when things were stabilizing! As more British infantry approached the ridge line, the Mahdists dug in and started bringing up more troops. The Camel Jockey leader without a name circled around, picked up a unit of spearmen and headed back into the fray in the center. Nearly cut off, he was forced to retreat then worked around to my right flank. We had decided to play once through the deck and then play out our hands unless once side broke. 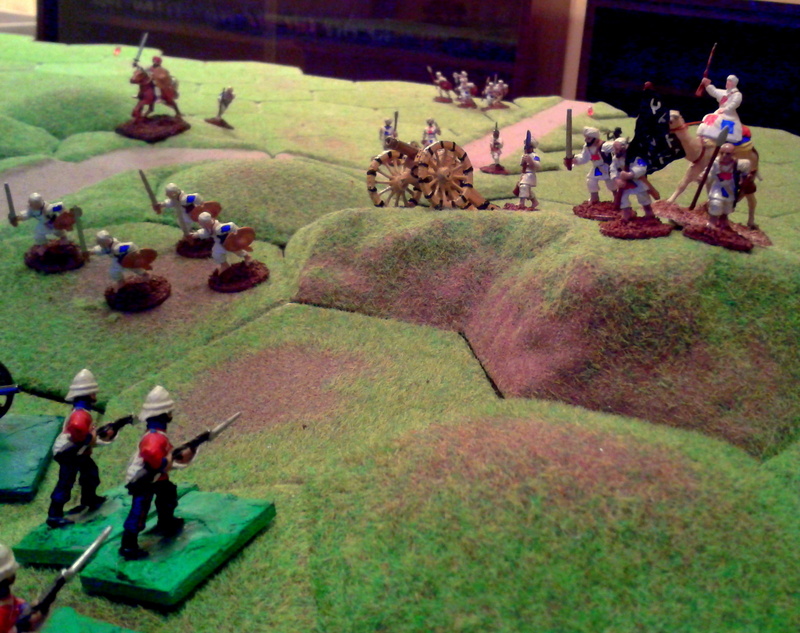 As the game wound down I managed to get one unit back up on the hill, in position to earn a draw. Alas the Mahdist gun which had finally managed to work its way up onto the ridge fired with devastating effect followed by a charge by the Camelleer which wiped out my unit. I reached my break point and was evicted from the hill as the last card was played. Argghhhhh! Not again! What will the papers say? The Black Flag waves in triumph from the hilltop. It was about 2 weeks ago now that Ron and I took Battlecry to the Sudan. (My Sudan collection got bored and cold and went off to sunny California a few years ago). The scenario selected was #9 Attack on a Camp from Scenarios for Wargamers. I drew the Brits and put the lads to sleep with a few Bengal Lancers on duty. Ron's spiffy new dice get a spin as the vedettes gallop back to report the enemy's approach. As the camp was alerted I rolled the dice for each tent hex to see what it contained except that no artillery were allowed on the outskirts. Crossed swords indicated no military unit present while a flag allowed me to choose. Once no more of a certain troop type was left, that symbol would also bring nothing. This served instead of the morale test in the original Teaser and the vague mention of considering the effects of panic and confusion in the book version. I did fairly well, getting all but one of my units. My mission was to withdraw over the bridge with my army intact. The Faithful didn't seem to be as faithful as one might expect as they arrived late and hung around the back of the table. Long before any native warriors attacked the camp I had my troops up, some entrenchments build around the perimeter and had a start on evacuating. For a while it looked like I might get off almost Scot-free. At last, in desperation, Ron put himself at the head of a unit and charged ahead. At first the outer entrenchment held but finally the last officer went down in a flurry of spears and dice. Ron then led the survivors around and over a mountain gun. and finally charged over the bridge into the teeth of my artillery fire. Miraculously he survived but his followers didn't. A bridge too ..no can't say it. At this point there was no hope of the main Mahdist force catching the remnant of my army or forcing the bridge and I was still one away from my break point. He played his last card, a sniper. One die, if it came up swords one of my officers was going down and the game was his. 1 chance in 6. It was inevitable really. He was kind and took a subordinate, not me. Work is now underway on my permanent portable/family room game board. I meant to just paint it but somehow I found myself with glue and cans/jars/bags of flocking. The last time I flocked a board was in 1981 when I made a set of 2' x 2' geomorphic terrain boards. 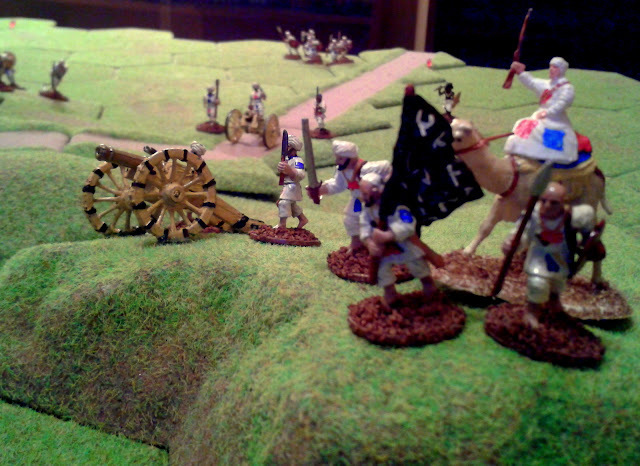 Some 1/72nd ACW troops trying out the new board. Thinking about my old boards got me thinking about the various surfaces that I've played on at home over the years. I'm not going to list every variation, for one thing I can't remember them all. For example when did I first get a felt cloth? At college? or after? Unfortunately I have no pictures of any of my college games for reference, just a B&W snap of a game at the Montreal Club probably 1975/76. In the beginning. The mountain in the background was part of a homemmade 1/72nd DDay playset my mother and brother made for me when I was a young kid. All I have left now is the beach. 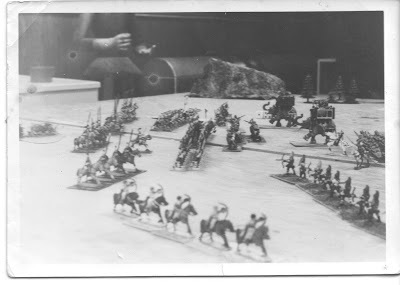 France 1940, GHQ microarmour on my geomorphic boards 1981. Hills, roads and rivers built in. After much debate, the new table will be 30" x 36" with a 10x12 grid of 3" squares. Since some of my troops are on 40mm wide bases, I was seriously tempted to go with an 8 cm grid but since I was starting with a 36" x 36" board, I would have had to reduce the number of squares to 11 x 10. or 11 x 9. The latter was tempting as it would have had a central square but in the end I opted for the extra row of squares. Most of the troops that I plan on re-basing haven't been done yet so 1.5" bases will be the order of the day. I'll live with the mm discrepancy on existing bases or take a file to them if it really bothers me that they over hang slightly. The 40mm 1812 guys kick the tires on the under construction board. This is still a work in progress but I think you can see the idea. The roads and streams will be felt or foam lay-on's, painted with flocked edges. Hills will be flocked shapes. The big table will probably be painted rather than flocked when I get to it as I've seriously depleted my stock of flock including a couple of bags abandoned by my brother-in-law and the warchest is empty. I'm also disappointed that the grass flock is not as bright a green as the fields that I drive past in summer. There was supposed to be a frame underneath and a backdrop.Did I ever mention that I can be a bit impulsive? Something for later than. A closer look at the board and prototype road section. I started to do strictly 3" squares but they looked too patchwork so I veered towards 6 inch squares subdivided into 3" ones. My plan was to do the main table in 6" squares but now I am thinking about the possibilities if use the subdivided method so that I can play on a table with the same 120 square grid using larger squares that will hold a 40mm wagon or limber but with the option to play with 4 times as many squares giving a larger field with 480 squares. As it is the small table will allow me to play most War of 1812 battles in 40mm using 6 man battalions. Not as impressive as 20 man battalions on the larger table but the combination of fewer figures, a grid and simple rules would make this just the sort of introductory game for non-gamers that I've been periodically writing about. I'm sure the tramp of little feet must be wearing down the road through Sawmill Village by now. Actually, this time you'll have to image a road running along side the fence and through the town. 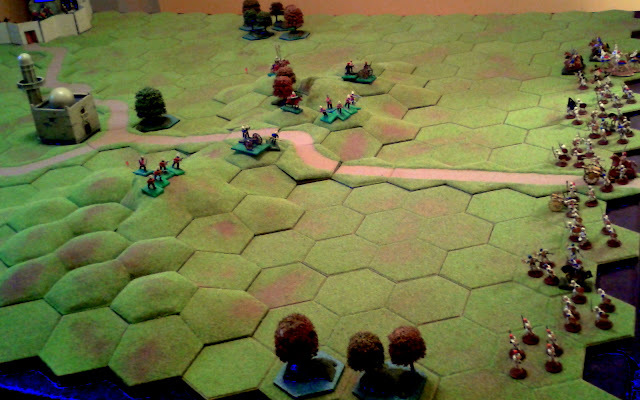 It was late and I was expecting a short game so didn't bother making a new road for last year's original Portable Wargame trial gaming cloth. The forces are the same as for Friday's games but it looks slightly different because the larger grid squares allowed me to use 2 stands per unit. I had intended to follow the same battle plan the Rebs rolled "1" order early on and opted to move infantry forward rather than sending in the cavalry unsupported. It was a sign. Unfortunately between the battery and the Federal riflefire, the cavalry didn;t make it back. The battery was out of operation for a while, which helped, but eventually it put itself back to gether and came back on line. The attack through the woods was slow to get under way and most of the 2nd brigade was shunted off to the far left to fill the gap left by the cavalry, thus complicating command control issues and not really helping. Finally the attack through the woods hit home. I am at a loss to explain why the Yankees didn't react in time to avoid being hit in the flank. Did I mention it was late? Beyond the time we can see an unholy line as the Yankees on the right outflank and drive in the Rebel left. The ability to retreat to avoid hits saved Reb units from destruction until they had retreated into a ball of desperately trying to rally units that could neither shoot or move other than to retreat some more. Nearly 2 hours into the game the Rebs finally got untangled and given time could have rallied if left alone but they were down 3 units to 1 not to mention a brigadier while the Yankees were firmly ensconced on the objective and not yet in a mood to leave the Rebs be. At this point I heard that there was a fresh hot pot of tea ready so I called the game rather than play to the bitter end. The rules as played during most of the game have just been posted. A doc version should appear before too long but after I test a non-gridded version. The Square Brigadier 3rd draft. This is the latest draft of a set of simple rules for horse and musket era battle fought on a gridded playing field. A word version will be posted once the rules are more settled. The rules were written with a square grid in mind but can be played on a hex grid or without any grid by multiplying the number of areas by 3" or such other convenient measurement as you choose Each rectangle or hex is referred to as an "area". The game is designed for relative effect not as a scale model. Early in the period units will usually be battalions of close order troops commanded by Brigadiers but later in the period or for smaller actions they will be companies or wings commanded by a Major or Colonel. Wargame units may be any number of figures on any sort of bases as long as they fit within one area. Hits may be tracked with markers or figures/bases removed. Where something isn't covered Hearts of Tin may be consulted as a guide. In the absence of a Game Master (GM) Common sense trumps any rule. In the absence of agreement, roll dice to determine whose argument is right. Play is IGO UGO determined at start of game, usually attacker first or dice for it. The first player rolls for orders then moves and shoots or rallies units. The second player then does the same. When he is finished the turn is over. Each side has one over all "General". If there are more than 6 units then the army should be divided into brigades usually averaging between 3 to 6 units plus a Brigadier. Some units may be left under the General's direct command. In large games an army may be divided into Divisions each with its own General. Roll 1d6 for the General to see how many orders he may issue. An order is required for a unit to move. No order is required to shoot, rally or fight in melee or to move a commander. Group Orders. A Battle-line formed by a commander and 2 or more units which are adjacent and side by side may be moved by a single order as can a Road Column formed by a commander and 2 or more units which are adjacent and 1 behind the other on a road. 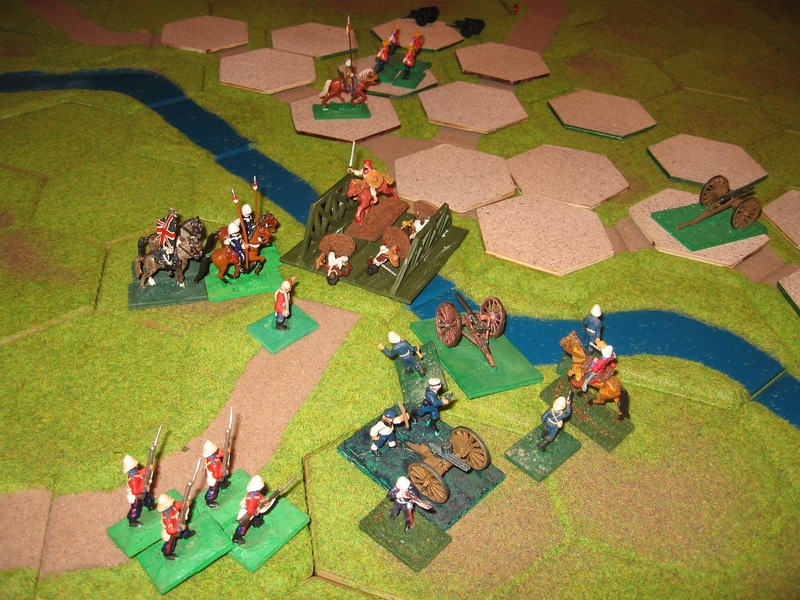 The units in battle line or road column do not have to maintain their formation during movement but which units are part of a battle line or road column is determined at the start of each turn. Carrying over. The general may save any unused pips on his order dice until the next turn but the total of carried over pips and the current die score cannot be higher than 6. Generals and Brigadiers are Commanders. Commanders move 3 areas. If not co-located with a friendly unit and if adjacent to an enemy at any point in a turn, roll for capture. If the commander rolls equal to or greater than the enemy he escapes and may move up to 3 areas. If a commander is attached to a unit which takes one or more hits, regardless of whether or not these are traded off, roll 1 die and on a 1 the commander is killed. Only 1 roll is made each turn. If killed a replacement takes over at the end of the next turn. A unit must face a side of a square or the angle of a hexagon but may change facing as often as required while moving. All movement is through the sides of an area, never through the angles. A unit may move less than its maximum but may not move more. Formations. Cavalry are assumed to dismount to shoot, artillery to limber or unlimber as needed. Units may be assumed to be in line or in an "attack" column with skirmishers as appropriate. Infantry in square should be marked. A square that moves loses its square status. Proximity. A unit which moves adjacent to an enemy unit must stop. If adjacent to one or more enemy units which are facing it then it must face one of these. A unit which begins its turn adjacent to an enemy must either face an enemy, no order required, or be given an order to move to an area which is not adjacent to any enemy. Only infantry, cavalry, armoured cars and tanks may move adjacent to known enemy. Stacking. Units may move through friendly units but only 1 unit may occupy an area at the end of its move. Commanders are not units and any number may be in an area with a unit. Cavalry may move 3 areas mounted and attack an adjacent enemy (treat as shooting) or may dismount, move up to 1 area and shoot. Horse Artillery may move 3 areas or move 1 area and shoot. Armoured Cars may move 3 areas or move 1 area and shoot. Infantry, Light Artillery and MG's may move 2 areas or may move 1 area and shoot. Tanks may move 2 areas and shoot. Other artillery including MG's may move 2 areas or shoot. Wagons may move 1 area. Trains may only move on rails. They may move a maximum of 4 areas but may only accelerate or decelerate by 2 areas per turn. Armoured Trains may move 1 area and shoot. Difficult terrain is any terrain with woods, buildings, steep slopes, fordable river etc. Armoured cars, wheeled transport and artillery other than pack artillery and MG's may not enter difficult terrain except by road. Any unit except irregular, tribal or "native" infantry entering a difficult area stops and may not move farther or shoot that turn. Roads. Units in column which are following a road for their whole move may add 1 area of movement but may not shoot and may not move adjacent to a known enemy. If using single stand units place a marker to indicate column status. A unit may change its facing before firing without an order but this will count as moving. A unit which shoots and moves may shoot either before or after moving. Line of Fire. The line of fire is measured from center of the firing area to the center of the target area. The LoF may be traced into but not through any area containing terrain or troops of either side. The arc of fire is 45 degrees either side of directly ahead. (60 degrees if using hexes) The firer must normally have a line of sight to the target area but artillery on a hill may fire over troops of either side which are on lower ground at a target which is not adjacent to the intervening unit. Artillery on a hill may not fire over terrain. Observed fire. Artillery capable of indirect fire may fire at targets they can not see if they are connected by telephone or radio to an observer who can see the target and the range is at least 6 areas. Range is measured from the gun but line of sight is traced from the observer. Indirect, observed fire may ignore intervening terrain and troops. Radios are very rare and must roll 2 or better each turn to connect. Telephones lines must normally be laid before the game begins and if either the observer or the battery move or are destroyed then the connection is destroyed. MG, Light Artillery, Superior Rifles: 4 areas. Effect. Roll 2 dice per unit. Each die scoring 4, 5 or 6 causes 1 hit on the target. -1 die if inferior firepower. 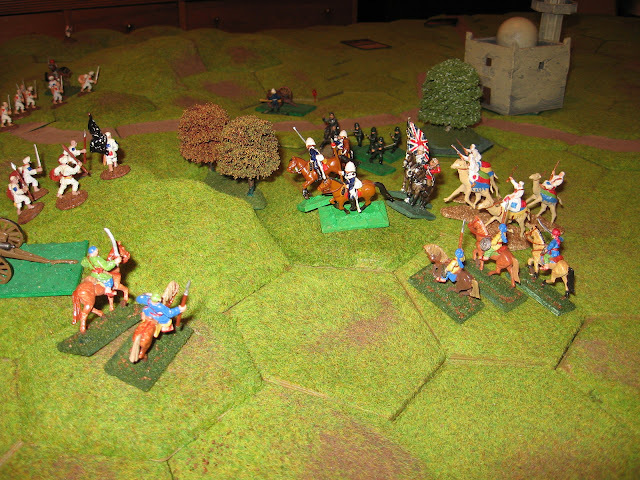 -1 die if the target is in cover or obscured or is cavalry, artillery or skirmishers. 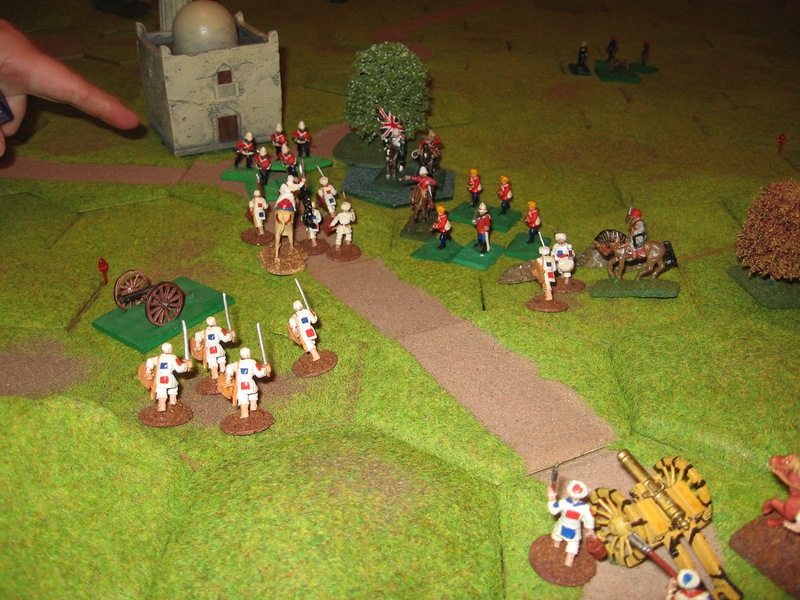 -2 dice if the target is armoured or if cavalry attacking an adjacent square.. Pursuit. If a unit which was only adjacent to 1 enemy unit destroys that enemy it may immediately advance to occupy the area the enemy was in and may resolve combat again against an adjacent enemy. Hits include morale and unit cohesion as well as casualties. Retreats. Each time a unit suffers 1 or more hits it may cancel 1 hit by retreating 1 area. Decide when the hit is received. The retreat must be directly to the rear and may not be into an area which is adjacent to an enemy or which is impassible or occupied by a friendly unit. Rout. An average unit is destroyed when it has accumulated 3 hits. Poor troops by 2 hits, Elite Troops by 4 hits. Rallying. A unit may rally if it does not move or shoot and is not adjacent to an enemy. Roll 1 die. On a score of 4, 5 or 6 1 hit is cancelled +1 if one or more Commanders are in the same area or if there is a support unit in an adjacent area. A unit which has been destroyed cannot rally. Victory. In the absence of a time limit or any other victory conditions for the scenario being played, an army which has lost over 1/2 of its units destroyed or retreated off table, must concede. ENGINEERING. Only Sapper units and units with an Engineering officer in the same square (treat an Engineer as a commander with no influence on combat or orders) may normally do engineering work. No order is required to work but a unit which works may not shoot, move or rally or be adjacent to the enemy. Roll 2 dice with a score of 4,5,6 indicating that 1 point of work is done. Simple tasks require 2 points of work unless otherwise specified for the scenario. Complicated tasks take 6 points or as designated by the GM. Adjacent refers to the 4 areas which are touching through a side (or if not using a grid 3" to the front, sides or rear or such other distance you are using. If using hexes . Front, rear, left and right. Troop capabilities and weapons will need to be determined before a game. EG, Some cavalry should not be allowed to dismount and shoot while most mounted infantry may not move adjacent to enemy..
Skirmishers. The rules assume that line units are deploying skirmishers where appropriate but if wishing to model skirmish only units or if wishing to allow players to choose then units designated as skirmishing count as in cover unless the enemy is adjacent. Skirmishing units do not get the adjacent modifier when shooting. If allowing some units to choose then the choice to change modes must be at the start of a turn and lasts until it is changed at the start of a later turn. Infantry units designated as skirmish only units may move through difficult terrain without penalty. So far the weekend hasn't gone as planned. I twisted my ankle badly Friday afternoon and couldn't walk on it by evening. It was quite a bit better this morning but I felt lousy all over. This meant that I didn't get much work done but as the day improved in did some paint onto some 40mm Pandours and I did a lot of thinking. Luckily I have learned not to take drastic action based on thinking when I'm tired, down or both so I haven't torn down my wargames table but I did break out the 3" grid again having realized that while I am quite taken with the idea of a game that fits the old card table and have proved to myself that it can work, I'm not wedded to it. The 2" grid won't work for me for anything larger than 1/72nd and even then 10mm would be better. I can fit 4x40mm figures in a 2" square but I just can't compress the terrain to fit in an acceptable fashion. Stylized terrain can fit on a 3" grid however along with 6 figure units of 40mm troops or 12 man 1/72nd units. The card table will only hold a 10x10 3" grid leaving no border but I would prefer at least a 12 x 8 grid for laying out teasers. Luckily I can rearrange things downstairs to fit a a 36" x 24" or 36"x30" gaming table. Lila getting a rules clarification about whether or not chewing "Dad's" figures is allowed. After getting a definite "Red Card Infraction" she lost interest, however, I did not go for tea until the game was over and the table cleared. Since everything was close to hand I decided to improvise Sawmill Village again using the old cloth with a 3" grid and try it with 2 stand units and tweaked rules. Four things got tweaked, order dice, diagonals, the shooting hit score and the melee rule. For order (aka activity) dice I went back to a concept I have used off and on for a while. 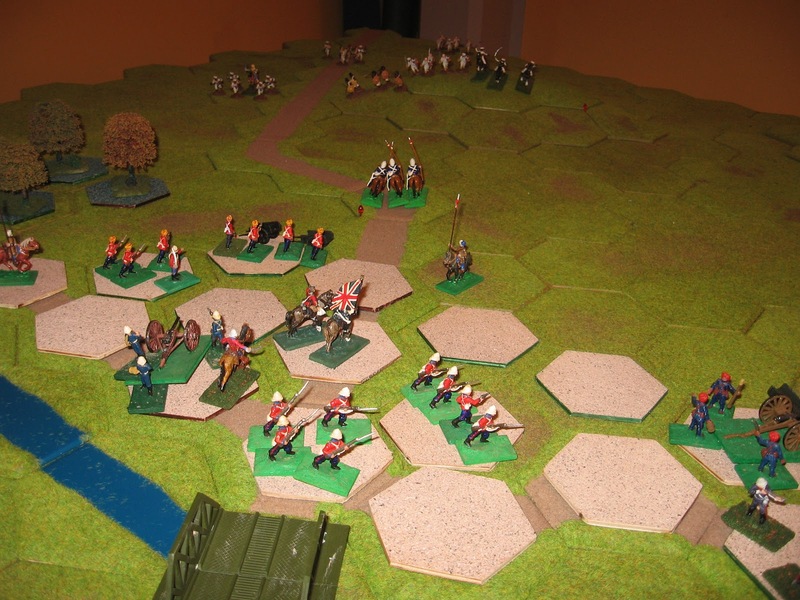 1 dice per Division General or equivalent with Pips being used to move a unit, a battle line of units including Brigadier or a march column including Brigadier. Like in DBA, the more organized the division is, the easier it is to control leading to attacks breaking down into firefights which don't need orders. With the diagonal, once I started playing with units allowed to face it, I had found 2 situations, the one where a unit faced the diagonal and the move was straight ahead and the situation where a unit faced a side but moved on the diagonal, essentially doing an echelon or incline. Melees were also awkward. I could foresee more and more rules being added to deal with things and decided that it just wasn't worth it. So I am essentially back to Bob's Portable Wargame movement and measuring rules. One difference is that I don't like having an enemy move through a defender's fire zone into a flanking position. Rather than getting fancy I will specify that if the defender can shoot at the attacker before he moves, the attack must go in on the front if possible. The shooting tweak was just that with only 2 dice, shooting was ineffective when only hitting on a 5,6 so I upped it to 4,5,6. This meant that melee was essentially the same but with an extra die and slightly different modifiers. I always found it odd in Battle cry that units couldn't automatically fire back even at 1 hex range but the more I looked at something similar the more it seemed to fit in here since the other side will automatically be able to shoot back. The current sequence means that the defender always shoots first then the attacker gets 2 rolls, one in his turn and then defensive fire in the other player's turn which hasn't sat well but the solutions I could think of called fro tracking which melees started this trun vs being carried over which I didn't feel like tracking if I could avoid it. With units attacking through a town, it was fuzzy as to whether or not they could claim cover in the 2nd round. Suddenly it seemed easier to just give a fire bonus for adjacent units. So, if an infantry unit has to move 2 squares to get adjacent then the defender will get first shot on his turn but if they only move 1 square (meaning they were already in range) then they get to shoot first with 2 dice before being hit next turn with 3 dice of fire. Cavalry will be allowed to charge 3 squares and fight. Here we will see a difference between muskets whose range is shorter than a cavalry move and rifles which equal to it. Cavalry will not be able to attack rifles without risking a round of fire during the previous turn. In practice the lack of melee rules seemed to work better than I had expected. More on the game tomorrow as well as the amended rules. The scene mid game, about Turn 5. Single figures are being used as casualty markers. The scenario played last night was Chance Encounter from Scenarios for Wargamers, aka Sawmill Village. This version of the scenario allows players to choose 6 units from a list. Partly to increase the size of the game to make it worthwhile under these rules and partly because the guidelines indicate that infantry units should be twice as large as cavalry and light infantry, I allowed 2 regiments for each "unit" of infantry taken. Both sides opted for 1 cavalry, 1 artillery and 4 infantry (8 regiments) divided into 2 brigades. Once again, playing the small version felt just like playing the full table version. I thought this was good till I found myself thinking troubling thoughts this morning but more on that later. By accident, the town in the middle was 1 square too far away to be occupied on the 3rd move so there was a clash of horsemen in the center of town which resulted in both sides falling back. The Federal commander opted to send one brigade straight up the road and the other with the battery up over the hill. General Kinch in charge of the Confederate forces deployed his first brigade with its left on the town supported by the battery and cavalry forming a refused flank. The 2nd brigade was sent through the woods. After a brisk exchange of fire, the leading elements of the Federal army were driven back and the Rebs occupied the town. A second, concerted attack took 1/2 the town but the Yankee battery was silenced and over whelming fire from the Reb 2nd brigade coming around the flank destroyed the Yankee first brigade. A final push took back control of the town and forced a precipitate Federal retreat. Johnny Reb sweeps the field. On the whole, I liked this version of the rules better than the previous one. I have always liked rules which adjust the total possible hits as well as the average but with most of my systems, unless you got into rounding and carrying fractions as in Charge! or used a look up chart, it was hard to arrange. Increasing the dice per stand has allowed me to play with the number of dice but of course that increases the possible total upwards when there are no unfavorable modifiers. In the event, I had put the computer away before setting up the game and then discovered that I didn't have a printed copy. Rather than dig it out again and I decided that I could remember them well enough and largely I did but I made an error and used 3 dice per infantry stand instead of 2. This made the fire and combat more deadly than envisaged and shortened the game, being the rules equivalent of rating them all as being armed with breach loaders, but it was still a satisfying if bloody game. I was especially pleased with the way the voluntary retreat worked vs the rout and rally system and I expect to see that ported in some fashion into HofT as well as Gathering of Hosts. I'm particularly pleased that it looks like it will allow me to use the same combat and morale mechanisms in HofT without giving up multi-element units. I will have to experiment to decide if more dice and more hit points improve the game or make it drag. Since I found that the grid offered no real advantages over measuring in cm, it actually looks like HofT could be used for both full and card table games. One unrelated issue was the Order dice, they are too generous and something like HofT where only 1 order die per division or maybe per side is rolled but where entire formations are activated might be more in order. However, I found myself thinking again about how troops are actually controlled which led me back to thoughts of persistent written orders vs dice. That's where the dangerous thoughts came in. I was playing around with a bunch of the single ACW figures from Rob's donation and determined that I could easily fit 6 or even 12 figures per 60mm square and be able to use stand removal for hits or use a system such as Mr Kinch's where officers are used to track hits. I have extra figures so this would allow me to play Teasers exactly the same as I would upstairs but with perhaps 1/2 the figures. Ummhhhh wait a minute, good for campaigns maybe but that wasn't the idea. I didn't set out to find a way to duplicate my ACW project in 2 modes in the same scale! If I can play games with 200 figures on the table, sitting down, why would I need to field 500 upstairs? What had been in my mind was a chance for various side projects to come out. Things like the RCW, WWI Colnial, Boer War, even 54mm toy soldier games with a token 4 figures per square. Something other than my main projects. It also occurred to me that cm HofT and a game with written game orders is a long way from a board game suitable to introduce non-wargamers to my hobby which was one of my goals for this year. Since nothing stops me from using existing stands of ACW troops for the occasional card table game whether gridded or using cm and HofT, and since I am not ready to give up my main table and convert the games room to a guest bedroom or something, I am going to put the ACW figures away again for a bit to avoid the distraction and confusion. I am also going to ditch the diagonal moves as the freedom clouds the issues and makes the game feel less like a game. In any event, I think its time to work on a permanent, flocked board since I see one or 2 games a week being played downstairs over the winter. and the reason why I need sides around my table and should never go refill my tea mug mid-game. Oh the humanity! Luckily they weren't Airfix. More on the test game later. Back to the real table on the weekend. This is the second (untested as yet) draft of a new attempt to produce a card table game intended primarily for wargames in the mid-19thC but capable of being extended forward and backwards to cover the early 19th & 20thC. I decided that it is close enough to the Square Brigadier, which was the 1st attempt, to use the name. To the previous influences of Joe Morschauser and Bob Cordery I now add Richard Borg. The biggest changes from the previous, Hearts of Tin based game are the replacement of die score modifiers by modifiers to the number of dice rolled and to the replacement of a compulsory rout when reduced to 1 stand by a voluntary retreat trade off to cancel 1 hit. If this works, I will rework HofT to be unit based rather than stand based since it allows better control, it was only an attachment to stands that stopped me from trying this last year. The rules were written with a square grid in mind but can be played on a hex grid or without any grid by multiplying the number of areas by a convenient number which is close to the frontage of an average unit, for example 2” or 6” or 4cm. Each rectangle or hex is referred to as an "area". The game is designed for relative effect not as a scale model. Early in the period units will usually be battalions of close order troops commanded by Brigadiers but later in the period or for smaller actions they will be companies or wings commanded by a Major or Colonel. Wargame units may be any number of figures on any sort of bases as long as they fit within one area. Hits may be tracked with markers or figures/bases removed. Where something isn't covered Hearts of Tin may be consulted as a guide. In the absence of a Game Master (GM) Common sense trumps any rule. In the absence of agreement dice to determine whose argument is right. Play is IGO UGO determined at start of game, usually attacker first or dice for it. The first player rolls for orders then moves and shoots or rallies units. Then melees are resolved. Each side has one over all "General" and should have a subordinate commander for roughly each 3 to 6 units. Roll 1d6 for each Commander to see how many orders they may issue. An order is required for a unit to move. No order is required to shoot, rally or fight in melee. Commanders do not need an order to move. The General may order any unit. It uses up 2 orders to issue an order to a unit which is more than 3 areas away or to a unit which is in the same area as a commander but not under his command. The Army General may defer rolling his order die until the next turn. On the next turn he may either defer again or roll 2 dice. The decision must be made before any order dice are rolled. Commanders move 3 areas. If not attached, roll for capture if adjacent to an enemy. If the commander rolls equal to or greater than the enemy he escapes and may move up to 3 areas. If one or more commanders are attached to a unit in melee, roll 1 additional die. If a commander is attached to a unit which takes one or more hits, roll 1 die and on a 1 the commander is killed. If a commander is killed, an order by the General is required to add a commander to one of the units in the Commander's old command. The replacement may not issue orders on the turn he is replaced. A unit may move in any direction and face any area side or angle after moving. A unit which moves adjacent to any enemy units must stop and face one of them. If it is in the frontal arc of one or more of the enemy units it must face one of these. A unit which begins its turn adjacent to an enemy must either face an enemy, no order required, or be given an order to move to an area which is not adjacent to any enemy. Only infantry, cavalry, armoured cars and tanks may move adjacent to known enemy. Only 1 unit may occupy an area at the end of its move. Commanders are not units and any number may be in an area with a unit. Infantry and Tanks may move 2 areas or may move 1 area and shoot either before or after moving. Cavalry, Horse Artillery and Armoured Cars may move 3 areas or move 1 area and shoot either before or after moving. (Cavalry are assumed to dismount to shoot, artillery to limber or unlimber as needed). Wagons may move 2 areas. Trains may only move on rails. They may move a maximum of 4 areas but may only accelerate or decelerate by 2 areas per turn. Armoured Trains may move 1 area and shoot before or after moving. Difficult terrain is any terrain with woods, buildings, steep slopes, fordable river etc. Armoured cars, wheeled transport and artillery other than pack artillery and MG's may not enter difficult terrain except by road. Any unit except irregular, tribal or "native" infantry entering a difficult area stops and may not move farther that turn. Roads. Units in column/limbered which are following a road for their whole move may add 1 area of movement but may not shoot and may not move adjacent to a known enemy. If using single stand units place a marker to indicate column status. A unit may change its facing before firing without an order but this will count as moving. The line of fire is measured from center of the firing area to the center of the target area. If the LoF crosses any area containing terrain or troops of either side then it is blocked. The arc of fire is 45 degrees either side of directly ahead. (60 degrees if using hexes) The firer must normally have a line of sight to the target area. Gaps must be as wide as the firing unit so, for example, a unit cannot shoot on the diagonal between 2 occupied squares. A unit which is adjacent to the enemy may not shoot or be shot at. Roll 2 dice per unit with small arms, 3 dice per artillery or mg unit. MG, Superior Rifles: 4 areas. -1 die inferior firepower or if smoothbore artillery firing over 1/2 range or if artillery firing observed fire. 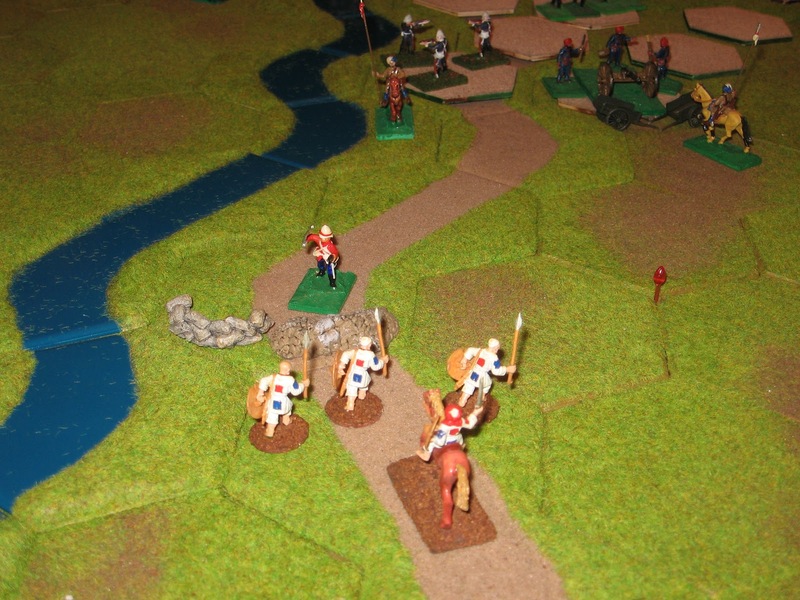 -1 die if the target is in cover or obscured or is armoured, cavalry or artillery. Dense targets. If there is a unit of either side adjacent to the target and the line of fire would go through it if extended then roll 1 extra die against this unit counting as an obscured target A unit in road column is also a dense target, roll an extra die against it. Melee must be resolved during the appropriate phase if opposing units are adjacent. Roll 2 dice per unit if there is an enemy unit in an adjacent area in the unit's arc of fire except that units in road column only roll 1 die. The dice may be split amongst eligible targets as desired by the rolling player but the decision must be made before rolling. Each 4,5 or 6 causes a hit. 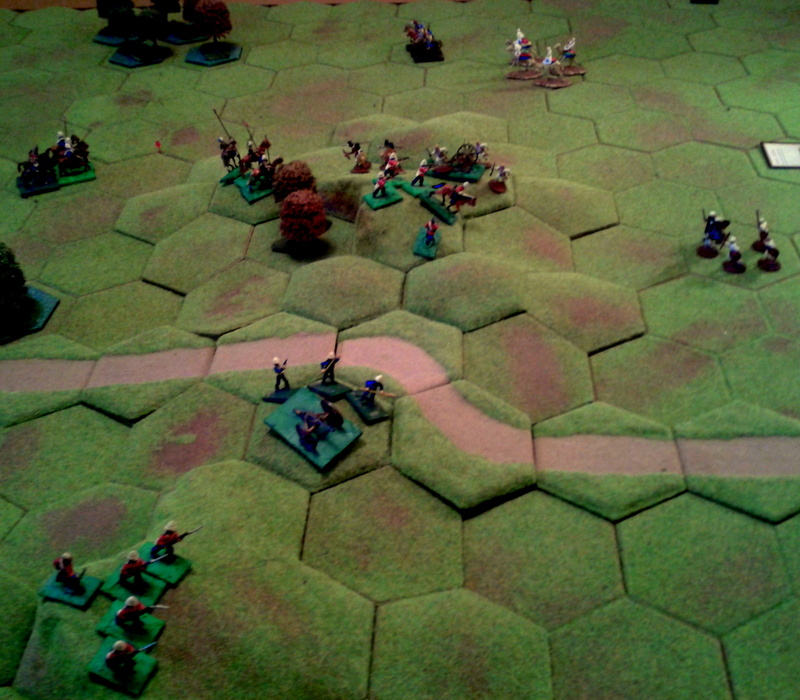 The 2nd player rolls first with infantry and artillery units and the hits are applied then both sides roll simultaneously with any remaining units. Each turn, each unit may cancel 1 hit from shooting by retreating 1 area. Each turn, each unit may cancel 1 hit from melee by retreating 1 area. If a unit retreats off board it is lost. A regular unit is destroyed when it has accumulated 3 hits. Militia by 2 hits, Elites by 4 hits. An army which has lost over 1/2 of its units must retreat unless the scenario says otherwise. Adjacent is any area which is touching either through a side or a corner or if not using a grid then means units which are within the base distance apart.